Denis Grey, the Bangkok bureau chief for Associated Press, wrote in an article that appeared in the Seattle Times on March 30, 2008, under the headline of “Buddhist No Shrinking Violets,” that scenes of “Buddhist monks hurling rocks at Chinese in Tibet, or peacefully massing against Myanmar’s military…run counter to Buddhism’s philosophy of shunning politics and embracing even bitter enemies” (n.p.). Grey expressed a view that is widely held among non-Buddhists, a view that is, in fact, belied by the 2500-year history of the religion that Grey alludes to. Fundamental to the teaching of the Buddha is the recognition that although it should be the goal of his followers to seek ultimate transcendence of the world, following the path to Nirvana (Nibbāna) has to take place within the world. This has meant that Buddhists from the very beginning of the religion have had to engage rather than shun politics. 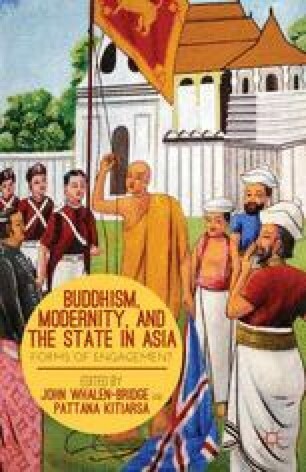 This chapter was first presented as a keynote address at the International Workshop on Buddhism and the Crises of Nation-States in Asia, jointly organized by the Asia Research Institute and the Faculty of Arts and Social Sciences, National University of Singapore, June 19–20, 2008. I am indebted to Jane Keyes for her comments and suggestions on the preliminary draft of this chapter. Anderson, Chantal. (2008). Dalai Lama Given Honorary Degree at UW. Northwest Asian Weekly, April 19, 2008. Retrieved from http://www.nwasianweekly.com/old/2008270017/degree20082717.htm . Heim, Kristi, Janet I. Tu, and Nick Perry. Politics follows Dalai Lama to Seattle. The Seattle Times. August 11, 2008. Retrieved from http://seattletimes.com/html/localnews/2004341378_tibetchina11m.html. Accessed on December 6, 2012.